Gordon, I am so glad to have met you and so enjoy how you set your own pace and do what you want in this MOOC as you did in Rhizo14 without pontificating about how the web should be for ‘all of us’ or how ‘higher education has no future’ or… [fill blank with grandiose statement of your choice] And once again cheers for the commenter thingy – awesome work. MOOCow, I laughed our loud at this interview and also note the profound reflections you have to offer us all. Although we part company with the Cogdog bashing thing…He shares many of your views and is always talking about the Ying-Yang nature of the web, you know? But may be that is just too happy-clappy for a serious MOOCow? We might need to introduce you to Talky Tina and Anna Cow from DS106 a few fields over on the right from where you live when you are not jet setting. The too have super web powers and may have a lesson or two to share with you. I will let them know about your latest publication and may be they will come and visit. PS Playing with Pythons is dangerous. Thanks Mariana – my lack of pontification, as MOOCow points out, is more because of a reluctance to study deeply than a deliberate ploy – I do enjoy programming though with its clean ‘either it works or it doesn’t’ nature – as opposed to what works for learning theories 🙂 But yes, there are dangers. I will pass on your remarks to MOOCow when (if?) I see her again but she has a life of her own and is totally out of control. I think she’s at peace with cogdog now knowing he’s not really anti-cow and, as a remote admirer of DS106 for some time, I’ll make sure she gets the full picture when (if?) she gets back from Tuva. I think she’d also love to meet Talky Tina and Anna Cow! Thanks Vanessa – I think I’ll give MOOCow a rest now – but as I’ve said above, she’s totally out of control! Gordon, I know of your work through Vanessa, who often blogs your posts. I remember about a year ago trying to describe to her “‘la vaca de los sinvaca’ – by José Bogado”, without knowing anything about what I was describing, but knowing that I was fascinated. She finally figured out what image I was referring to, even with my awkward descriptions. So I had forgotten all about that incident until now, when I saw the image again, and I needed to read this. Although I do not follow much of the tech-world and am not good at it at all, what you say is universal. Thank you for describing us all! Good of you to come over to comment Ana. 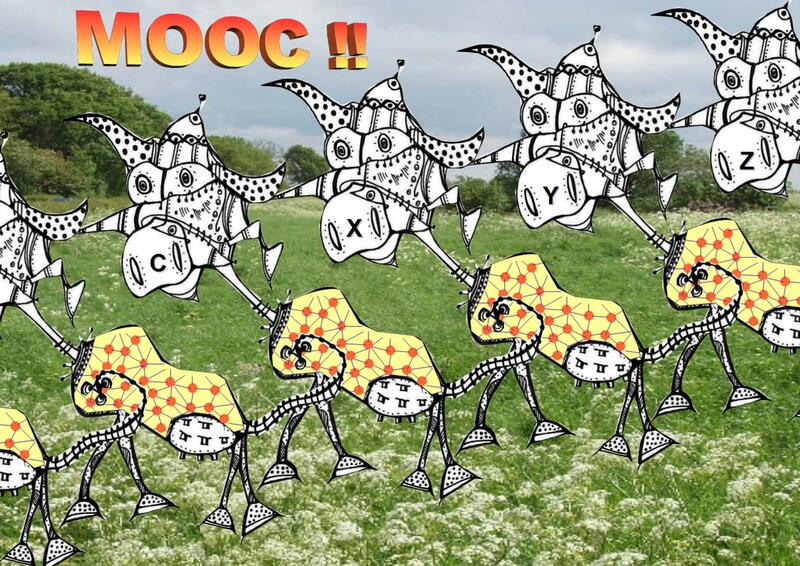 I originally did the MOOCow illustration during the CCK11 MOOC on Connectivism in 2011 as a sort of literal embodiment of what I thought were some of the more outlandish features of the theory. I’d no idea it would take off as iconic art! I could never have created José Bogado’s drawing myself but was lucky enough to find it with a Creative Commons licence allowing remix. So I worked on his image using LibreOffice. This was not difficult but I’m no expert and it did take some time. I’m fairly convinced now that many tech skills can be readily picked up if the will is there without bothering too much about what’s ‘under the hood’. Online help is always available if you get stuck. Don’t be scared to ask – I’ve NEVER had a dusty response from anyone online, particularly in cMOOCs where people understand the importance of making connections. Hope to see you around again! Thanks so much Gordon: I will remember that! As to the help needed, I will also remember your words, or I will try, when I’m deep in despair because I cannot get something to post, hahaha! I need to remember “the will is there without bothering too much about what’s ‘under the hood’. Well, I think that a cow can’t talk, so that is funny. But if it helps you learn it, then it has a good part, even for a MOOc. But ds106 is #4life, so make some Art, bub! . Plus, @cogdog is my Still True Friend, and so for that reason plus he said it was a sidekick then that is a kind of car, but not a violin of it. So, get out there and learn! And, make a GIF of it while you’re at it! I’m honoured to hear from you Talky Tina and mulled over your wise comments at great length while brushing my teeth this morning. Yes cows can talk, pigs have wings and some MOOCs at least never die. Hmm – never made a gif. Maybe I should try. Gordon, meet Talky. She is our ninja talking doll teacher on DS106. She is a great example of what you said to Anna. Always there to help us answer questions to learn how to make better digital stories. Some of us have a bit of an addiction to the animated gif as a short story form, I must confess. She was made some pancakes to help us learn perspective all in one gif. It was great art! Yes I’ve seen some of the DS106 gifs Mariana. Impressive they are too but it takes me so long to do arty things! Deer Gordon, Do play with snakes and be careful. As a cow I do not Lurk either, but I am not Sampling as well/not. A cow is a grazing animal, we do eat what is in front of our nose. We digest it and change it in a product of of our own. 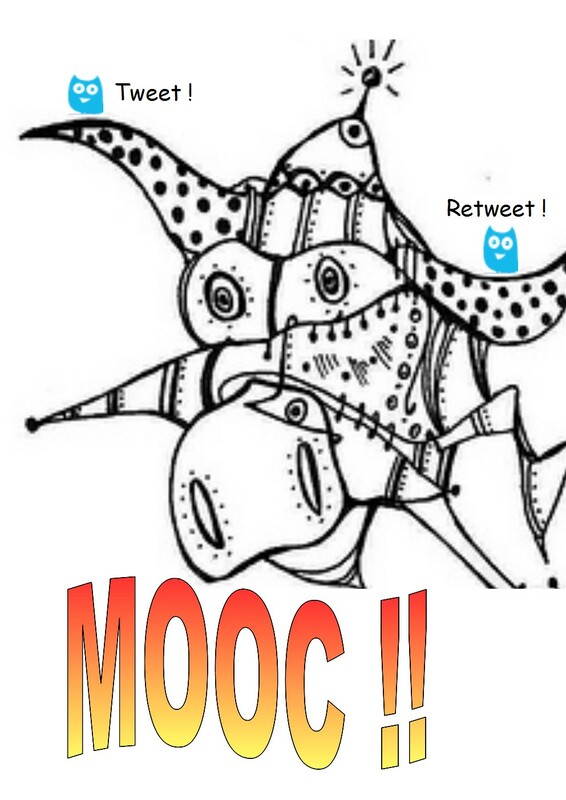 MOO-cing is not about learning, it is about what you do with what is before your nose. Learning must not be a goal in itself, it is a means to creativity and productivity.